"I was very impressed with the workshop that you all led, and I took a wealth of information back to my school for my school's music program. Thank you so much for sharing your talents. Thank you so much for all your help and direction. You lead a wonderful workshop!" 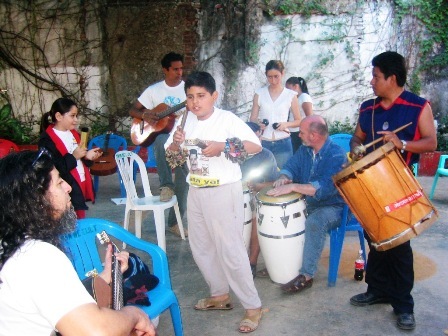 A presentation of the three main roots of Latin American music. In this lively, interactive performance you can hear how Pre-Columbian, European, and African musical influences have blended together in different countries in Latin America to become what each region can now claim as its own style. The presentation includes information about socio-cultural context of songs as well as the display of unusual string, wind, and percussion instruments from Latin America. Participants will have opportunities to play along with the music. A study guide accompanies the performance, which includes an extensive glossary of terms and resources for further study. 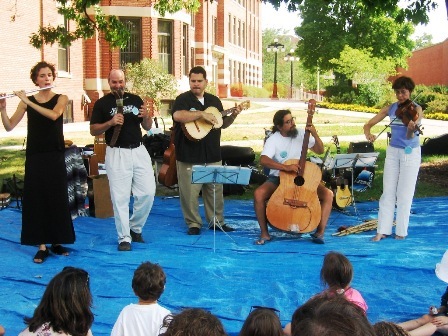 The group will customize their program to fit the interests of your organization and develop performances with music from specific cultures or countries. In depth descriptions of the many instruments of the Andean or Altiplano region, such as the quena, quenacho, tarkas, sikus,bombo, chajchas, charango, etc. Sotavento will demonstrate the usage of these instruments in the traditional musical styles of Bolivia, Ecuador, Peru, Northern Argentina, and Chile. An overview of percussion instruments and rhythms played throughout Latin America, from the Argentinean zamba to the bomba and plena of Puerto Rico. In this workshop participants will have the opportunity to learn and play some of these rhythms. A presentation of Andean panflutes, from the very tiniest chulli to the longest toyo. Sotavento will demonstrate the different ways in which sikus are played and the various musical styles in which this instrument is used. The group will help participants to learn the basics of playing with easy-to-learn siku pieces. In longer residencies, siku making is an exciting workshop where participants will make their own siku. Music scores are provided for this workshop. Dynamic and vibrant, this musical is representative of the richness and diversity of Mexican cultures. This workshop presents a historic outline of the son, the main characteristics of the genre, and the musical instruments and ensembles within each son tradition (huasteco, calentano, istmeño, jaliciense, jarocho, abajeño, arribeño etc.) throughout Mexico. Participants will have the opportunity to play different son traditions. 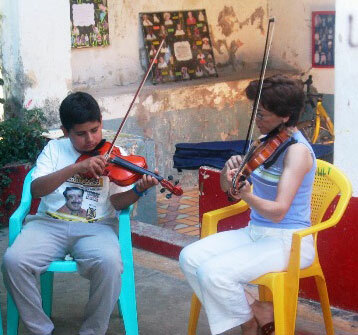 Musical instruments are required for those who want to play. Music scores are provided.